Not all parents will want to participate in this. Some believe their children’s place is in the pew with them, learning reverent behavior by witnessing the participation of adults. And because parents are to be the first and most important educators of their children, this is absolutely their right and should not be discouraged. At the other end of the spectrum are parents who will want to send their children as much for their own sake than for their children’s — who will not want to participate on the children’s liturgy teams. Depending on their situation, they may need a little encouragement . . . or a bit of forebearance. There was a time when the demands of parenting were so unrelenting, I desperately needed a few moments’ peace. At that time, children’s liturgy was a Godsend. Those who serve on the children’s liturgy teams, then, are ministering to both children and their parents. Children’s Liturgy should not be an extended coloring session. It should follow a form similar to that of the adults, listening to the readings and responding to them appropriately, using visual aids and other resources to help the children understand what they are hearing. The point of children’s liturgy is not to entertain children, but to educate and inform them until they are ready to participate alongside the adults in the prayers and service of the Church. This entry was posted in faith, Faith and Family, family, family life, Mass and tagged children's liturgy by heidihesssaxton. Bookmark the permalink. Our parish offers Children’s Liturgy of the Word twice a month and it’s run very well by volunteers. 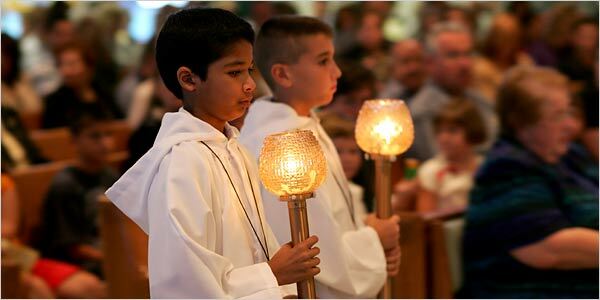 Children ages 4/5-12 are dismissed just after Mass begins, they go into a gathering room where older children (4th-6th grade) read the scripture & lead the Psalm (recited, not sung), then an adult volunteer reads the Gospel and speaks a “homily” directed toward the appropriate age range. They sing a song, receive a stamp or small token relating to the Gospel message, and rejoin parents during collection/presentation of gifts. My girls still enjoy attending (although my older daughter is about to “age out,” she can still serve as a volunteer). They have carried the banner and also served as readers. Adult VIRTUS trained volunteers are always needed to lead the homily or just walk around and settle down some of the boys. I’ve helped a few times and for the most part the kids are well-behaved and seem to enjoy the Children’s Liturgy of the Word.